If you are looking for professional metal engraving services, we can help. At Able Engraving, we engrave signs for a variety of different shapes and sizes to suit your design needs. Based in Surrey, our specialist team of engravers use the finest technology in the industry to produce the highest quality engraved products, using their many years of knowledge and experience gained. To find out how we can help you with any metal engraving requirements, please call our specialist engravers team on 01342 843 211 or alternatively, email sales@able-engraving.co.uk and we will get back in touch as soon as possible. Engraving available for all kinds of signs, plaques, plates and more! We operate in and around Surrey, London, Kent, Sussex and throughout the UK. Over 30 years’ experience operating within the industry. Highest quality machinery and equipment used for outstanding results. Wide client base including local councils, government, medical practices and more. Here at Able Engraving, we receive orders and enquiries for a wide range of metal engraving services. We prepare brass, bronze and aluminium signs which are designed to withstand all outdoor weather conditions. Our materials used can be specially cut to fit the shape and size desired. 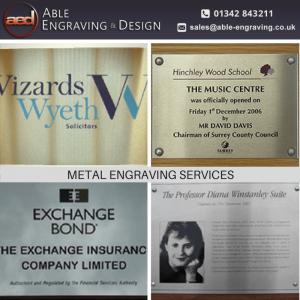 On our site you can find a selection of previously designed engraving products which we have produced in the past as well as testimonials featured from some of our many satisfied clients. Our products adhere to the ISO 9002 Quality Control Standards and we can quote prices on request. Whether you are looking for aluminium, brass, stainless steel or bronze meta engraving services, let Able Engraving take care of your needs. If you are in Surrey, London, Kent, Sussex or within the UK, contact us for assistance with your engraved product requirements. To enquire about our metal engraving services please on 01342 843 211 or send our team an email enquiry to sales@able-engraving.co.uk. We look forward to hearing from you.